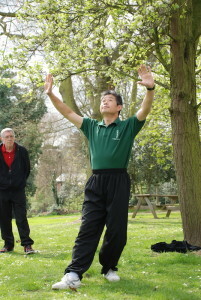 When we practise Qigong we should notice that our breathing is different from before. Beginners only focus on breathing in and breathing out with the movements, they do not notice that there are many kinds of breathing for example deep breathing, shallow breathing, fast breathing and slow breathing etc. What does breathing in these different ways mean? When we practise Qigong we should relax and not think about our breath in order to free naturally. This is the key point, do not try to interrupt your breathing just let it happen in whatever way, and then you will notice your breathing changes to different rhythms. If we find we are breathing very deeply it means our internal body is strong and can take more air in and also that our body needs more air. This is good as it means the body has opened up and so more air can come in. The more air the more Qi will be created. Therefore breathing deeply will give us more Qi. In contrast if our breathing is very shallow it means our body is weak and though it wants to have more Qi it is too weak to take more air in. Of course the more we practice then eventually we will breathe more deeply and then we are now healthier than before.